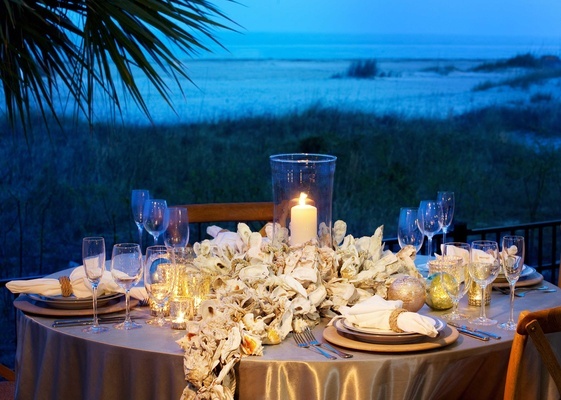 Consider the easy-going ambience of South Carolina's island destination for your nuptials. 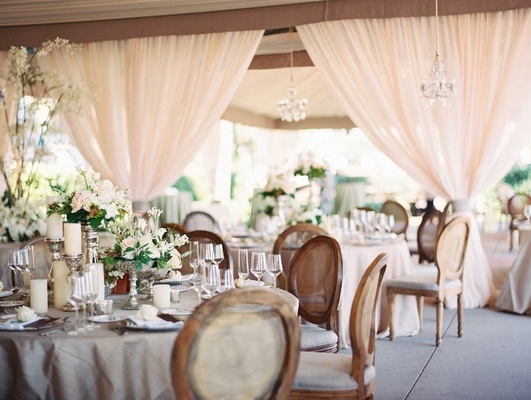 Learn more about wedding events on Hilton Head Island! 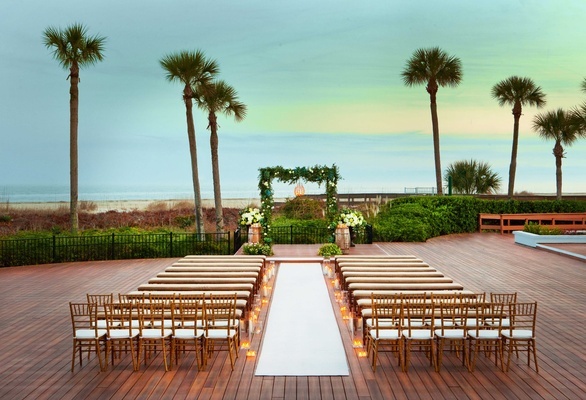 Coastal wedding ceremony set on the Oceanfront Deck of the Westin Hilton Head Island Resort & Spa. 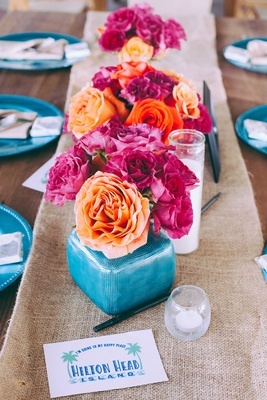 Colorful wedding reception in the Oceanfront Pavilion of the Westin Hilton Head Island Resort & Spa. 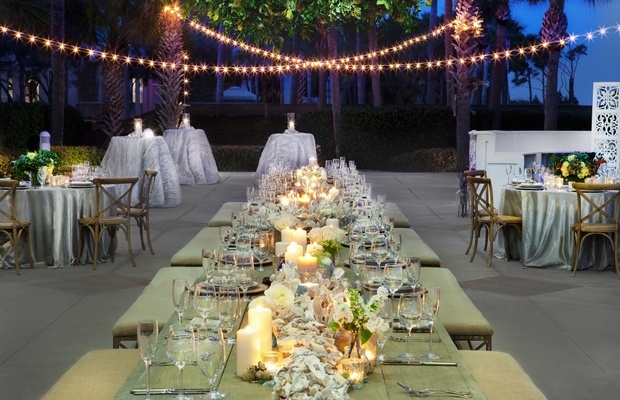 Romantic wedding reception in the Oceanfront Pavilion of the Westin Hilton Head Island Resort & Spa. 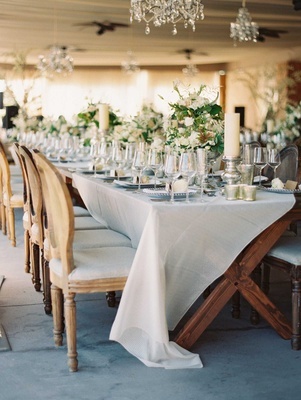 Coastal wedding reception table in the Oceanfront Pavilion of the Westin Hilton Head Island Resort & Spa. Cocktail reception in the open-air portion of the Oceanfront Pavilion at the Westin Hilton Head Island Resort & Spa. Destination island weddings are appealing to many couples for a variety of reasons: wonderful weather year-round, an exciting chance to spend quality time with loved ones, and the opportunity to experience new history, cuisine, and scenery. While many brides and grooms travel to international island destinations that require a passport, there are some options in the U.S. – besides Hawaii – that offer a unique destination island experience. 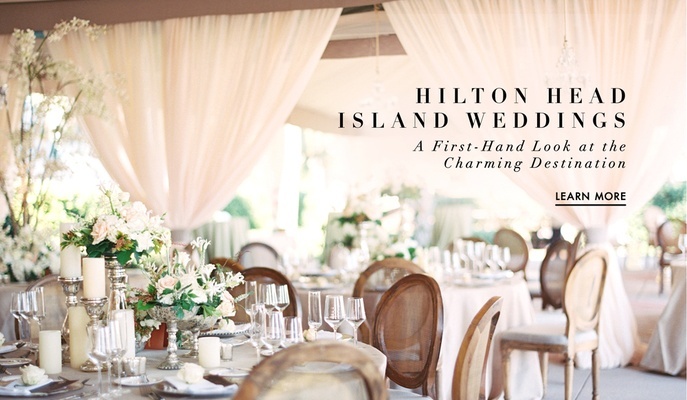 Marry an island wedding with Southern charm on Hilton Head Island, South Carolina, known as the "Caribbean of the Carolinas." In August, Inside Weddings got a first look at one of the island's resorts to experience this destination wedding experience. The event, which was hosted by Mary-Frances Hurt – founder and CEO of DFW Events, Inc., was attended by Inside Weddings publisher/editor-in-chief Walt Shepard, Inside Weddings executive creative director Art Scangas, among other wedding professionals including the president of Bella Flora of Dallas, partner and creative director of Jackson Durham Events, owner of Kelli Corn Weddings & Events, owner of Viva Bella Events, as well as the president and a planner for TOAST Events. 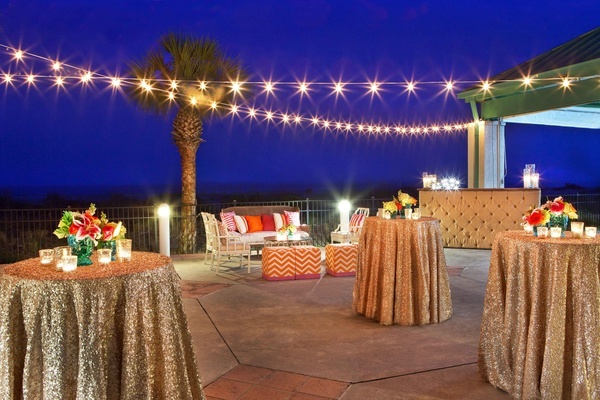 Kicking off the event with a welcome party on the Oceanfront Deck, the #WedattheWestin event introduced industry professionals to Hilton Head Island as a premier coastal destination. The next day, attendees enjoyed beachfront morning yoga, followed by breakfast, lunch, and a gourmet food and wine dinner in the Grand Ballroom. The following day, guests took a boat cruise to Old Town Bluffton, had lunch at the private South Carolina Yacht Club, experienced a tour of Hilton Head Island, and savored a coastal-chic dinner featuring a farm-to-sea-to-table dining experience on the Oceanfront Pavilion. Each of the items on the itinerary – including specialty excursions like zip lining – mirrored the types of events and activities that could be arranged during a destination wedding. From historical discovery, to water activities, to shopping, the charm of Hilton Head Island is ideal for a romantic weekend. Fresh off of a $30 million renovation, The Westin Hilton Head Island Resort & Spa offers coastal décor across all areas of the property. Many event spaces are available to make your dream wedding a reality, and the resort offers six restaurants and bars, three oceanfront pools, and 12 miles of beach for wedding guests to enjoy during their stay. With average daily temperatures between 60 degrees and 90 degrees in the most extreme months, the island is an ideal destination wedding location in any season. 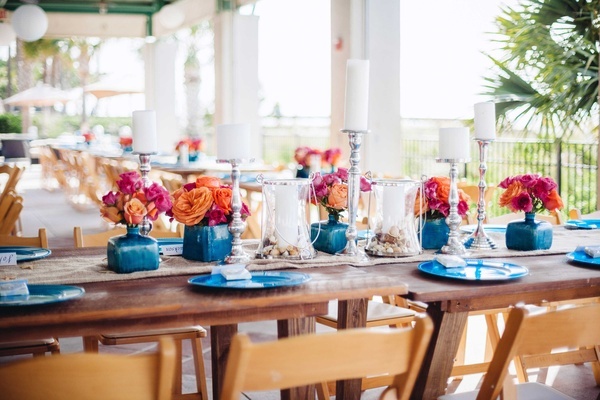 Unlike other destination wedding events, the island features a diverse wedding industry, so couples won't need to bring in outside vendors for rentals, linens, entertainment, and more. Browse the slideshow above to see picturesque ways to style your coastal destination wedding on Hilton Head Island! 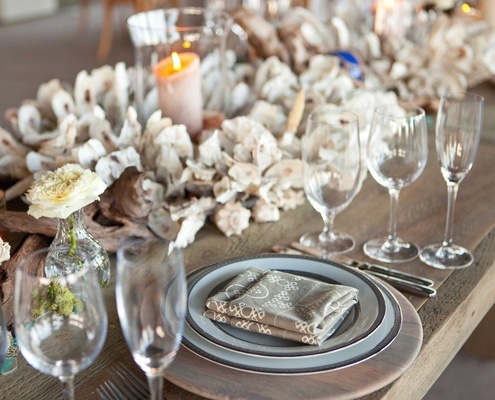 Whether you choose fun, vibrant décor, a romantic color palette of neutrals with blush accents, or a purely coastal theme with shell and driftwood elements, your guests will love getting a taste of this island destination gleaming with Southern charm.